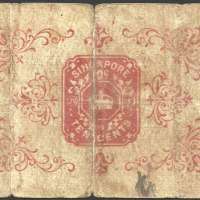 THE GOVERNMENT OF THE OF THE STRAITS SETTLEMENTS Promises to pay the bearer on demand at Singapore TEN CENTS Local Currency for value received. 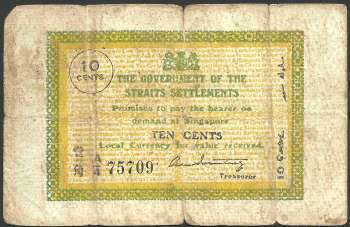 On the 5th October 1917, the Straits Government issued an official Government Gazette notice number 1313 announcing the intention of issuing the 10 cents banknote to counter the shortage of coins in the Straits Settlements. Very large numbers of these notes were put into circulation and the value of those issued by 22 September 1920 was $1,925,484.80 equals to 19,254,848 pieces. Date of printing can be checked on the reverse side of the note. Printed around the red seal. Day is to the left of the crown, month to the right and year at the bottom. Due to the thick open texture paper used for printing, the notes were quickly to absorb moisture and dirt. It was then replaced by a new ten cents note. Due to silver shortage, as most of the silver went to melting pot once they arrive in China coast due to the intrinsic value of the metal exceed the face value, the Government of Straits Settlements vide The Legal Tender Enactment 1913 and Amendment Enactment 1917 allowing them to issue Emergency Banknote with face values of 10 and 25 cents. The locally issued 10 cents notes were extensively counterfeited and a great many of these forgeries circulated side by side with the genuine ones. The Emergency Notes undoubtedly saved the situation but, even so, small change was often a great difficulty and postage stamps and tramway tickets were sometimes offered. Exist in 2 different signature varieties. The first issue was made on 8 October 1917 and bore the signature of the Honorary Mr. Hayes Marriot then acting Treasurer (on the note it appears as Ag Treasurer). Last known date was 1 September 1918. The signature of the Treasurer of the Straits Settlement, Honorary Mr. A. M. Pountney, C.B.E., appears on notes starting on 2 January 1919 until 10 June 1920. * If there's any date I am missing, please leave a comment below. Green and yellow as primary colours. Coat-of-arms of Straits Settlements at upper center. Crude design, thick paper and discoloured. Folded into 4 vertically and 1 horizontally. The note was actually separated into two but was put back together, not noticeable unless closely scrutinized. On the back of the note is a decorative design of scroll work. In the centre a representation of a ten cent Treasury Revenue embosses stamp cancellation; all in red. In the Straits Settlements, the rise of silver in the summer of 1917 brought currency troubles. The bullion parity of the dollar and the half dollar was 97 cents per ounce, and that of the subsiadiary coins was $1.083 per ounce. The price of silver passed the dollar parity before the end of August, 1917, and early in September passed the subsidiary-coin parity. The silver dollar had been replaced in circulation to a considerable extent by currency notes. There was not only a large population of Chinese but also many Indian. Both classes took every opportunity to make small exchange profits. When silver passed the subsidiary-coin parity, they began to hoard the coins. By the beginning of September the sudden shortage of small silver was noticeable and was causing inconvenience to the public. On October 1 the Legislative Council passed a bill authorizing the issue of 5-cent, 10-cent and 25-cent notes, legal tender up to $2. Locally printed 10-cent notes were issued before the middle of October and were helpful in meeting the needs of the public. At the same time some Chinese hoarders were prosecuted and given exemplary punishment. Meanwhile the price of silver receded to below the subsidiary-coin parity, so that it was only during September and October that the small-change question was acute. The Government recognized, however, that the samll notes were only an emergency solution. Because of the widespread of notes instead of silver dollars and prompt action taken to protect the subsidiary coinage, the Straits Settlements passed through the wartime rise in the price of silver without any serious difficulty.